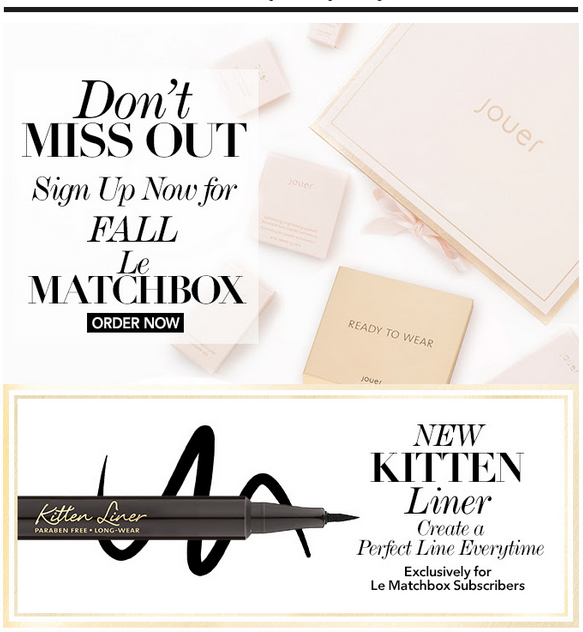 The new Jouer Kitten Liquid Liner! I've become more and more interested in liquid liners. I'll be interested in trying this since I just went through ALL my liners and dumped the ones that were dried out or didn't make a solid line (liquid) and the ones that were dry, tugged and/or there was a color similar that worked better. It was a lot of liners... Haha. So now I guess I need to bulk up my supply again. What do you think? It's definitely a more expensive box but it's also a great way to experience Jouer, as well, without paying even close to full price. Since this will be their third box, I'm really curious to see how they took the feedback from the last few boxes. I've had issues with their customer service via email (non-existent, at least in the form of ever getting a reply) and the value of each box has see-sawed. I can't deny the product is great, though, so it's still worth it to me. Sign up (for emails, I guess, since they're not taking new subscribers) here. They called me today because their crazy website didn't save my payment or shipping details from the last box. This company has lovely products, but they do have some *problems* of various sorts. The website interface is not stable. I had to call to verify my color choice and skin type choice initially. Then there was the data loss today. I did confirm that they are not planning on opening any more subscriptions but will sell each box, even pre-release, to a non- subscriber for $65. What I think this means is that they simply lack the resources to add to their recurring shipping base, so subscribers are guaranteed to have a box made for them, but those who didn't subscribe when subscriptions were open, don't have the same guarantee. I agree that it's a really nice box at the subscription rate. The products are very pretty and versatile for most women, and the presentation is lovely. Their website is TERRIBLE! I feel like they should scrap the whole thing and start over. :D I saw the Instagram spoiler for the 2 palettes and I can't WAIT for the Cool one to get here. I do wonder how many other items there will be. It seems like they keep lowering the value.